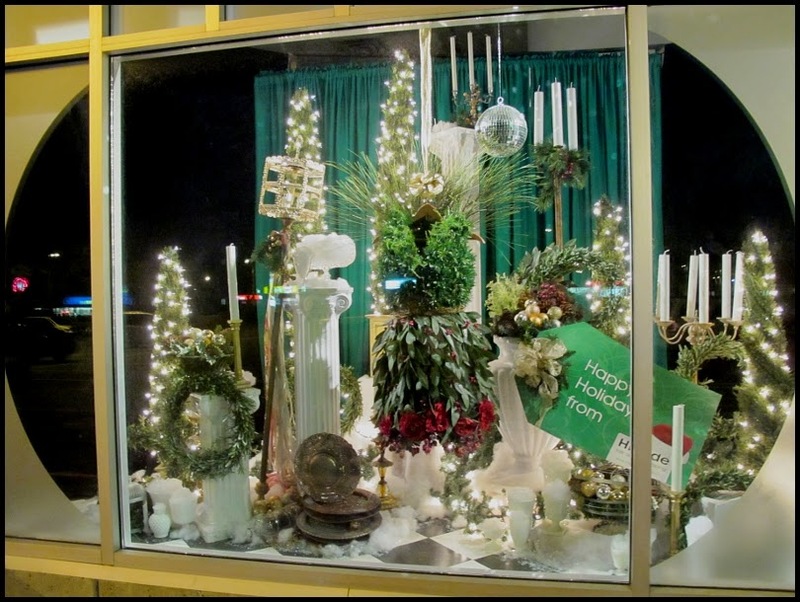 Happy Holidays: Better late than never - The major window display. 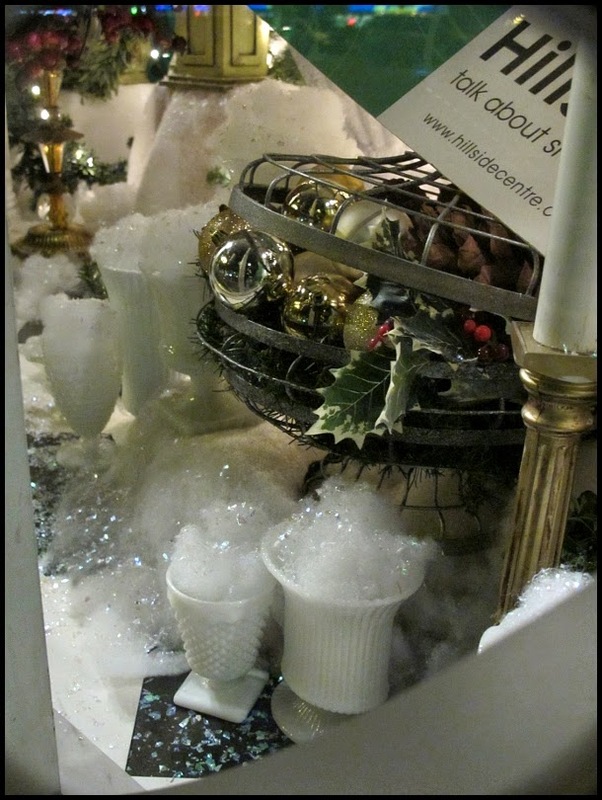 Better late than never - The major window display. I have photographed this window three times and each time there was so much reflection that they were unusable. My son has a polarizing filter for his camera and when he was out last night he took these photographs of the window for me. Thank-you so much Mike. 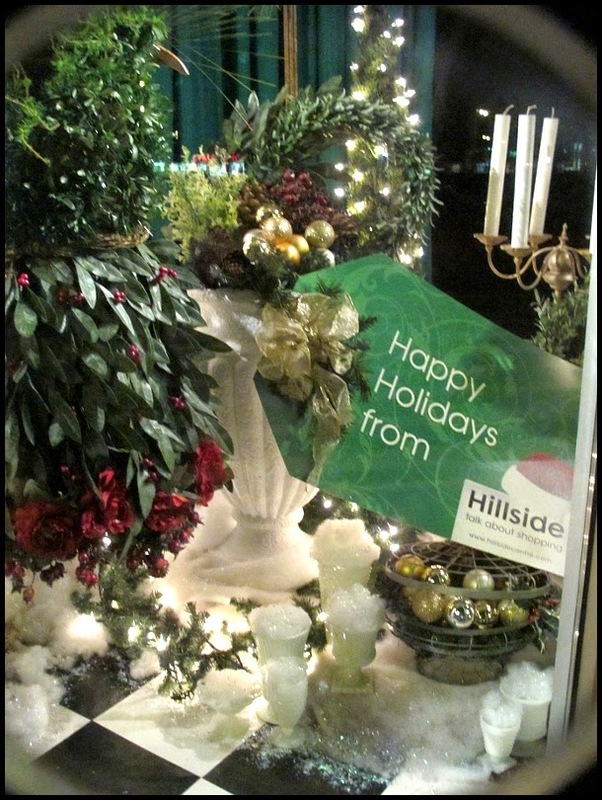 This is the large window display that I did for Hillside Shopping Centre. 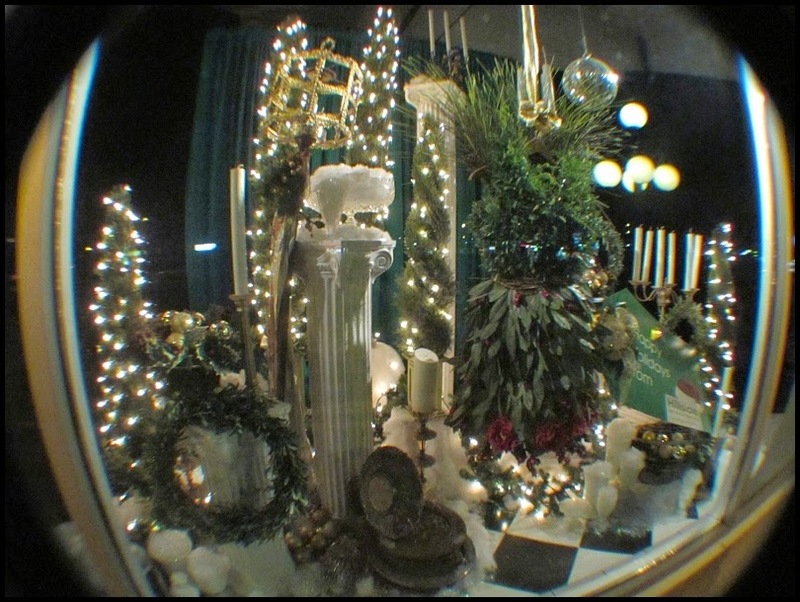 I have shown you the other window displays in this post and this post. I thought that you may like to see some of the props that made their way into the big window display. 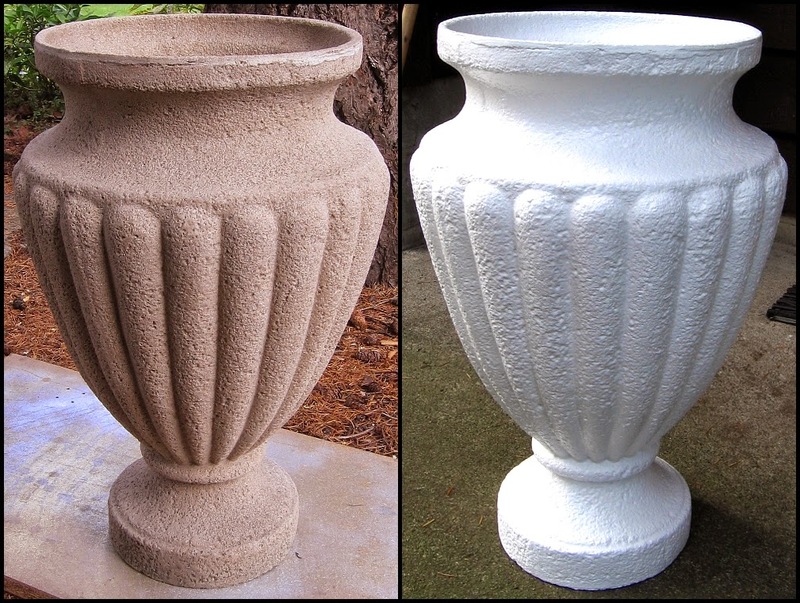 This urn is about 24" tall and was an extremely ugly reddy/yellowy/beigy colour. The colour, besides being ugly, did not work with anything else in the display. I liked the shape and now it fits into the colour scheme. 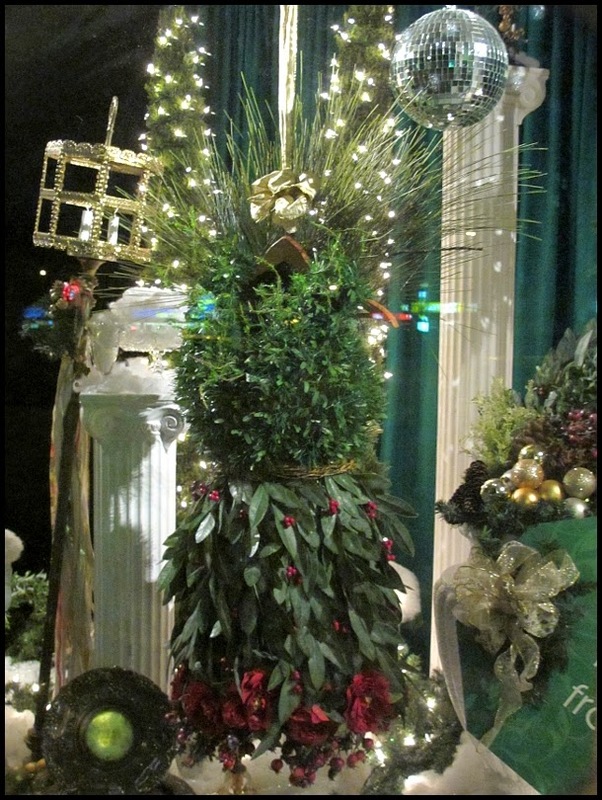 Black and white with evergreens are the predominant colours and accented with a variety of golds, silvers, and red. Spray paint works wonders to unify everything. I used several golds and silver when I sprayed each article. One item had more of one colour in it than the others so that it looked different but the overall look was unified. That black candle holder was on top of the tallest column when I was putting the window together. I hadn't fastened it to the column, forgot it was there, moved the column slightly, it came crashing to the floor. One arm was broken in two places and was unrepairable. I reassembled the candelabra, it now has the centre candle holder with an arm on either side. I think it looks a lot better. Mike, said that it was too busy before and looks better. I totally agree. I picked up two of these lamps at a Salvation Army Thrift store, they were $19.95 each. I took both of them apart. The bases have been used as very ornate candle holders. One of the metal shades along with the parts from a very old floor lamp have been turned into my version of a Venetian parade lantern. I wonder what kind and colour of fabric was inside that shade? The lamps were made in Spain. For some reason I think the colour was red. If anyone knows for certain I am curious to find out. 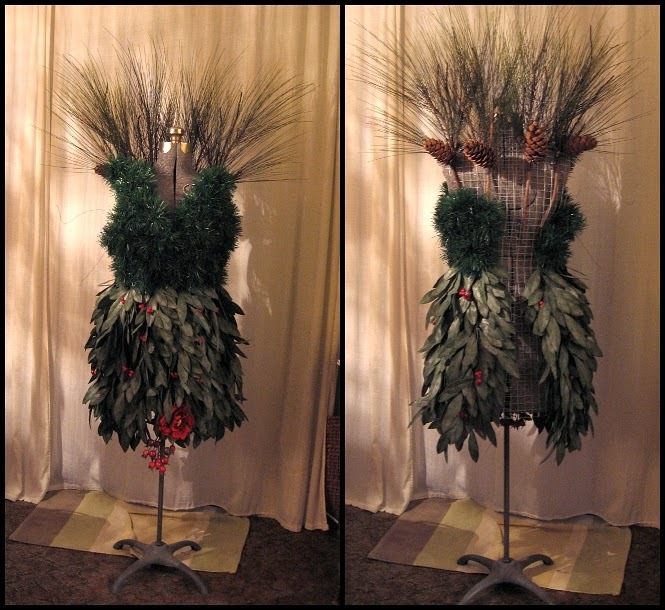 Here is a front and back view of the "cocktail" dress in progress. I used a hardware cloth base and wove the evergreen branches into the wire. The back of the dress is where the two edges of the hardware cloth join. It was lightly wired together so that I could remove it from the bust form. Mike took this image with his fish-eye lens. I liked it and decided to include it. This is what the window really looks like. I had about three weeks to come up with this window as well as the other windows that you have already seen. It was a very hectic but very rewarding time. 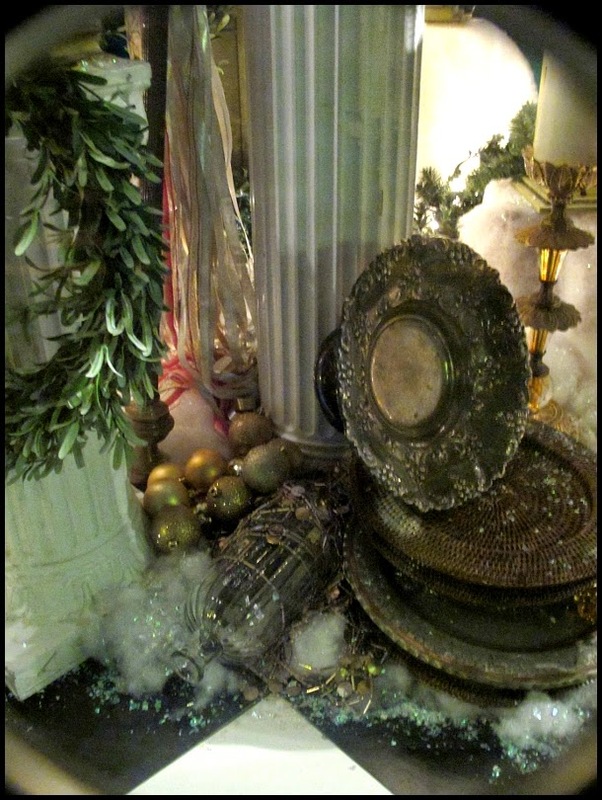 I went with this theme because I had the columns, the trees, the wreaths, and the milk glass already on hand. The rest of the props I found at the Salvation Army and my favourite secondhand store, Jacklin Trading Post. Here is the finished cocktail dress. 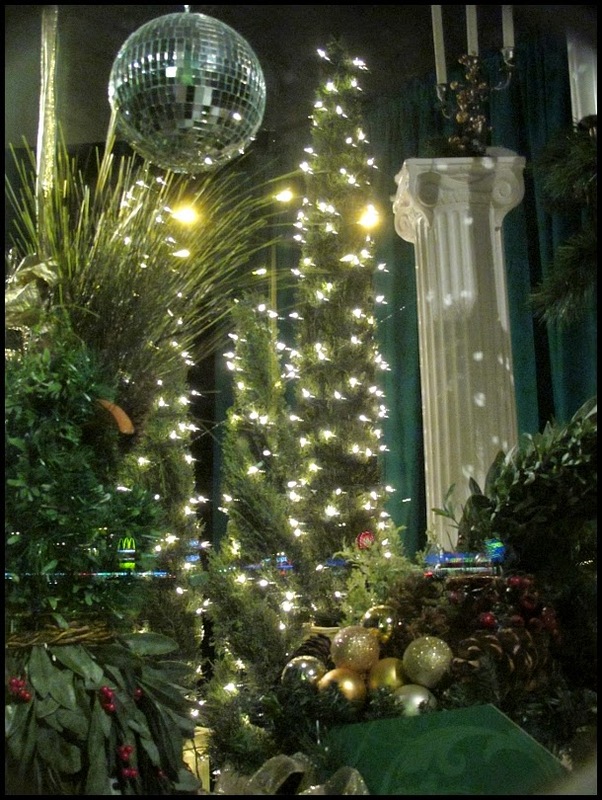 I saw the 10" disco ball at Superstore and liked the juxtaposition with the vintage and antique items. Nothing says party like a disco ball! In the background on the left hand side you can see the Venetian parade lantern resting up against a column, it has been securely wired in place. 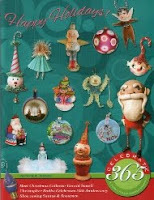 I had hoped to post this before Christmas to give everyone some ideas for decorating, well... Happy New Year! 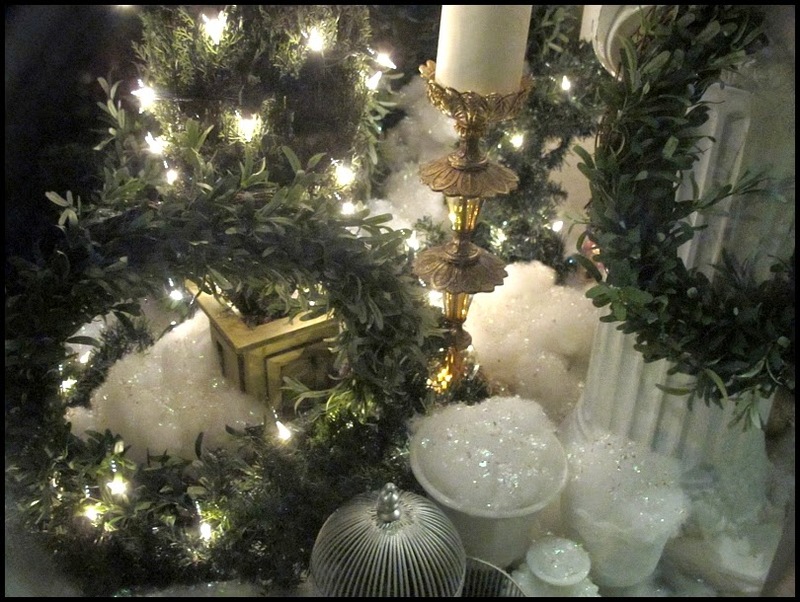 If you have a group of milk glass or clear glass fill it with polyester batting, sprinkle some snow on top, drape some mini lights behind the glassware with or without polyester snow on top of them and you have a very fast and festive decoration for the mantle or buffet. You could use this for a New Years Eve party. Another view from the side. The candelabra on top of the large column is the one that I knocked to the floor. 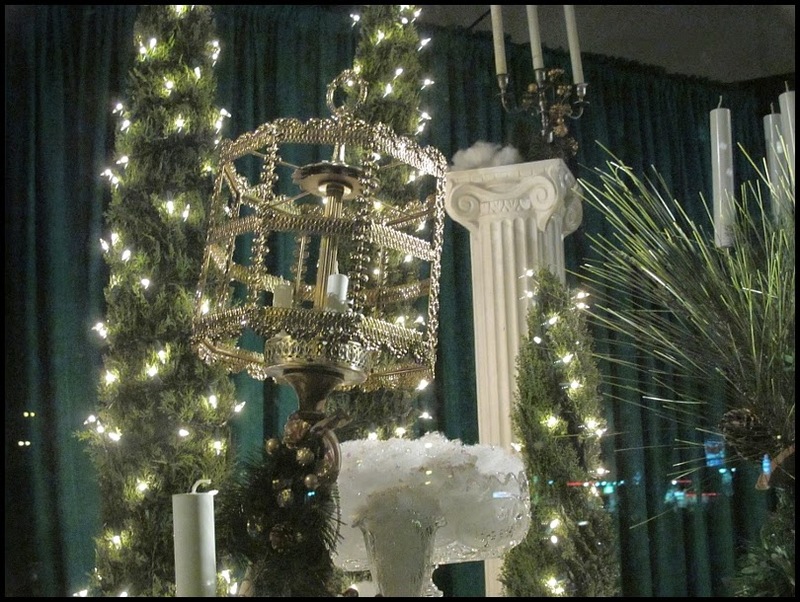 Here is a close-up view of the Venetian parade lantern that I created from various lamp parts. The black and white tile floor pulled everything together. I created it with thin glossy card, loosely spray painting the pieces that were the black tiles. That urn in the background looks so much nicer now that it is white, it ties in with the milk glass vessels. 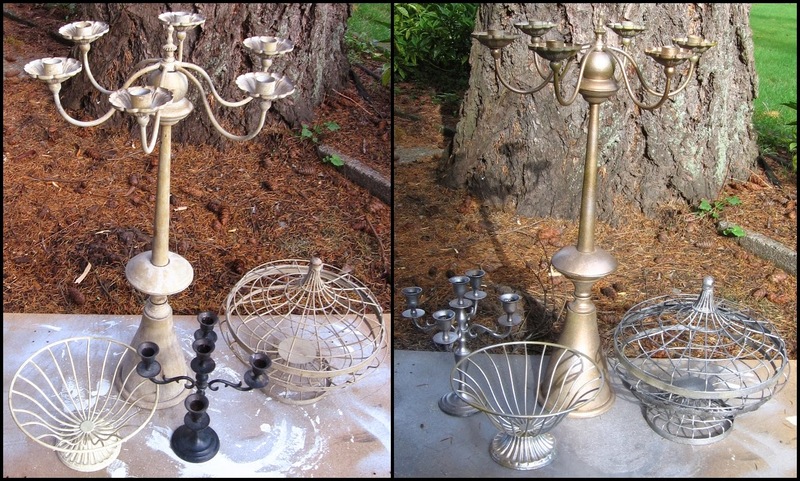 There is the base from the Spanish lamp, it makes a very ornate candelabra. All of the candles had to be made from either cardboard tubes or plastic pipe spray painted white. If I had used real candles there is always the possibility of them getting too warm and then bending off to one side. Those are the little things that the general public are not aware of but take time to make. There we have it it. I didn't have it ready to show for Christmas but it is still the holiday season. A truly elegant window display. I love how you re-purpose so many items. It's great! Thank-you. I had a lot of fun, and very long hours of hard work, doing this window. It's interesting I've always re-purposed items, I can create the look of an item for a fraction of the cost. I did props for a theatre for a while many years ago. I always re-purpose things in my sculptures as well.